^ Guadamuz, Andres (2016). 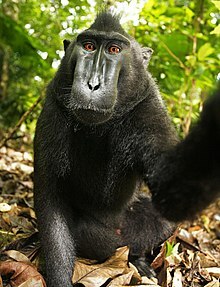 “The monkey selfie: copyright lessons for originality in photographs and internet jurisdiction”. Internet Policy Review 5 (1). doi:10.14763/2016.1.398. 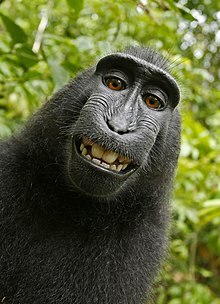 http://policyreview.info/articles/analysis/monkey-selfie-copyright-lessons-originality-photographs-and-internet-jurisdiction. ^ @WikimaniaLondon (2014年8月7日). "So this just happened... @jimmy_wales selfie with a #monkeyselfie #wikimania2014" (ツイート) – via Twitter. ^ Naruto, et al. v. Slater, et al., no. 15-CV-04324 (N.D. Cal. January 28, 2016). Order Granting Motions To Dismiss. http://www.courthousenews.com/2016/01/29/monkey%20selfie.pdf 2016年1月30日閲覧。.